Vladimir Putin spoke with students about science in an open lesson on September 1, the start of the school year in Russia. He told them that “the future belongs to artificial intelligence,” and whoever masters it first will rule the world. “Artificial intelligence is the future, not only for Russia, but for all humankind. It comes with colossal opportunities, but also threats that are difficult to predict. Whoever becomes the leader in this sphere will become the ruler of the world,” Russian President Vladimir Putin said. However, the president said he would not like to see anyone “monopolize” the field. “If we become leaders in this area, we will share this know-how with entire world, the same way we share our nuclear technologies today,” he told students from across Russia via satellite link-up, speaking from the Yaroslavl region. During the 45-minute open lesson (the standard academic hour in Russia), Putin also discussed space, medicine, and the capabilities of the human brain, pointing out the importance of cognitive science. 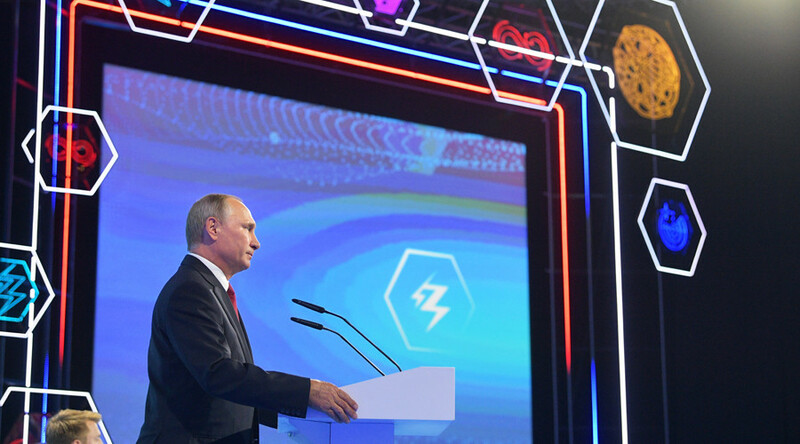 “The movement of the eyes can be used to operate various systems, and also there are possibilities to analyze human behavior in extreme situations, including in space,” Putin said, adding that he believes these studies provide unlimited opportunities. The open lesson was attended by students and teachers from 16,000 schools, Rossiyskaya Gazeta reports. The total audience exceeded one million.